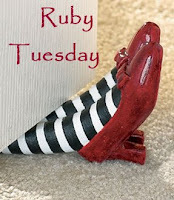 I did not have a new red photo for Ruby Tuesday this week, so I had to dig through my archives for something fitting. I came across this photo of Jake, who will be turning 6 this coming January. This photo was taken way before I started blogging. It was actually taken almost exactly four years ago.